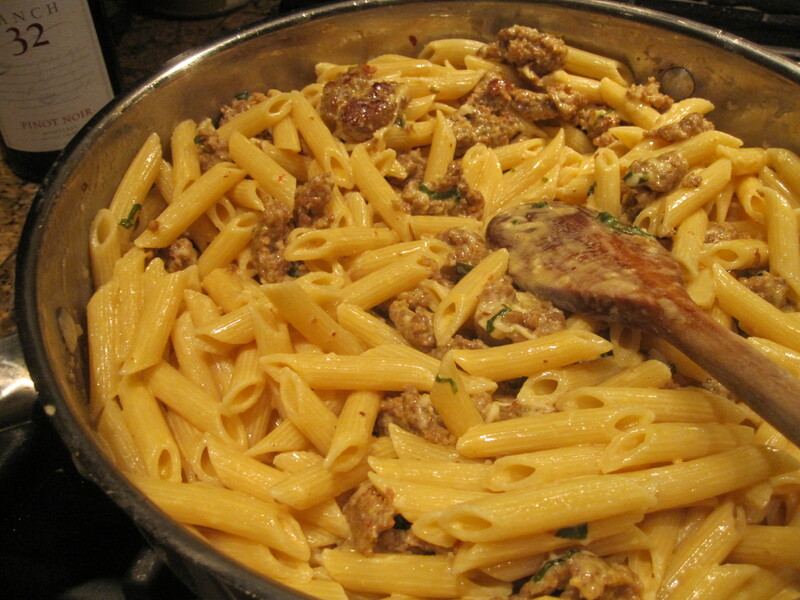 Penne with sausage | eat. cook. blog. Okay, so this dish has been made probably more often than any other in the Bruser recipe lineup. Saucy Pasta…formerly known as Kyle’s Favorite Pasta. It’s actually called Penne with Creamy Sausage Sauce, but really it should be called Everyone’s Favorite Pasta. When the kids were in high school, any time any of their friends would come for dinner, they’d ask me to make Saucy Pasta. And I’m not even sure why we started calling it Saucy Pasta…maybe one of the kids thought I said saucy instead of sausage? Whatever you call it…its one of our favorites. A little spicy (or saucy?) from the hot Italian sausage and a lot creamy from the thickened whipped cream and Parmesan. The recipe is from the Bonnie Stern CKFM Cookbook. What? You’ve never heard of the Bonnie Stern CKFM Cookbook? That’s because it’s at least 25 years old and Bonnie Stern is (or was?) quite the celebrity food person in Toronto, Canada. I’m pretty sure my sister-in-law Cheryl (from Vancouver) bought me the book. In fact, I think probably back when Tony & I were first married and visiting Vancouver, we were having dinner at Cheryl’s, she made it and I was like, “this is the best thing ever…what is it?” and then she sent me a copy (autographed, no less) of the cookbook. So there you go. The history of Saucy Pasta/Kyle’s Favorite Pasta/Penne with Creamy Sausage Sauce. It’s definitely a keeper. Heat the oil in a large skillet. Add the sausage, breaking it into pieces and crumbling it with a wooden spoon while it cooks. Add the garlic. Cook sausage until all traces of pink disappear. Add the whipping cream and nutmeg and bring to a boil. Reduce the heat and simmer gently for about 10 minutes or until the cream reduces and the sauce thickens somewhat. Meanwhile, cook the penne according to package directions. Drain the pasta, but do not rinse. Toss the drained pasta back into the sauce. Stir in the cheese and basil and toss until the cheese is melted and warmed though.